Cast on small size. Accidentally reduced by 2 too many stitches, but I think it’s actually a good thing for my skinny wrists. 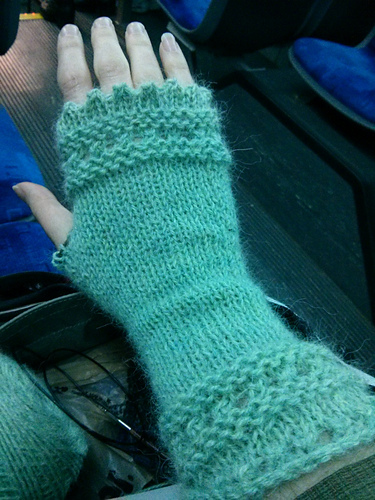 Might go up to the medium size for the thumb gusset, as it seems too short at the small size. Bound off first mitt with normal technique, feels a bit tight after finishing; tried “lace bind-off” (?) for 2nd one, not a lot better. Really needs a stretchy bind-off. Used odds & ends: Cascade Superwash 220 in blue & brown; Lions Worsted (?) in tan. 12/26 started tail 12/27 tail complete 1/3 did the comb (in chunky on #7 needle), still not sure how to do face 1/4 face with a bit of sock yarn. very pleased with how it turned out! Made a 2nd one of these using the fox ear pattern, didn’t like that so much. Four really excellent books: two histories, a graphic novel, and a cookbook.